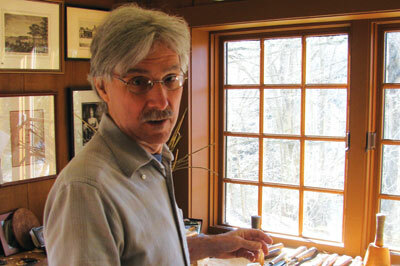 David Esterly is a master of his art. As a scholar of Grinling Gibbons' work and a self-taught carver working in a similarly deep-relief style, his skills are highly coveted. He has achieved the feat of making his own pieces, that, although inevitably derivative of Gibbons' distinctive style, are idiosyncratic in their own right; updating the work of this master carver for a modern audience. It was the late 70s when David first discovered Gibbons. He was walking down Piccadilly with the woman who would become his wife and as they passed St. James's Church, she suggested they go inside to see the reredos and marble font carved by Gibbons. As he stared up at the spectacular flowers, fruits and foliage adorning the altar, David had a conversion experience. He had hardly heard of Gibbons and had no experience in the arts, but the strong reaction he had to the carvings inspired him to write a book about him. He soon decided after beginning research on Gibbons that it was impossible to fully comprehend the incredible style of his carvings unless he had some direct knowledge of Gibbons' tools and techniques. David bought tools and lime (Tilia vulgaris) wood and began carving. With the first stroke of the gouge, he recognised something significant was happening. He put his pen aside and retreated to a cottage in deepest Sussex and taught himself to carve. 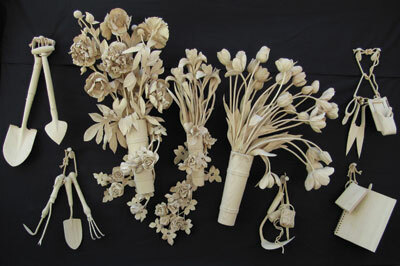 It would be another 20 years before his book Grinling Gibbons and the Art of Carving, which will be printed in its fifth edition in early 2013, was written. By his own admission, David doesn't give too much weight to inspiration. For him, turning up at the workbench every morning and starting where he left off is his working method. Like Gibbons, he works in lime wood, a British cousin of basswood (Tilia americana), and prefers to leave his carvings without a finish. In examining David's work, it would be easy to apply to it a quote from Horace Walpole who described Gibbons' ability to give "wood the loose and airy lightness of flowers, and chain together the various productions of the elements with the free disorder natural to each species." This sums up beautifully the organic abundance of a lot of David's work. We are lucky that David is, for a carver so proficient in technique, equally as interested in the scholarship of Gibbons, because this creates a discourse where the academic and the technical run in parallel, complementing each other perfectly. Although it is through his scholarship that David taught himself to carve, it is through his carving that his studies yielded the lost techniques and manual mysteries of Gibbons. I ask him more about the publication of his upcoming book and his future commissions. WC: Please tell us more about The Lost Carving: A Journey to the Heart of Making. DE: The book takes the form of a memoir of the year I spent at Hampton Court Palace replacing a Grinling Gibbons carving destroyed in the terrible fire of 1986. I think it's the first book on woodcarving published by a mainstream publisher - Viking, in the USA, and Duckworth in the UK - and aimed at the general reader. But I hope carvers will come along for the ride. 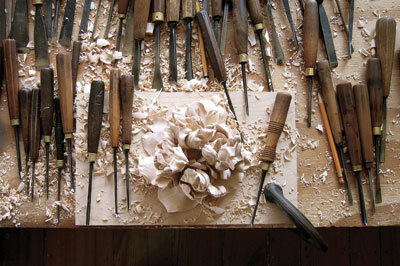 The book tries to get to the heart of what it is you do when you carve. What it means, in general, to make a thing well. And it would be nice if it raised the profile of carving to the wider world. People whose vocation involves creating with their hands are a minority now. But many are drawn to this kind of work in their spare time and I wanted to use carving as a way of figuring out why this is such an attractive activity; why it makes you feel more alive and closer to reality than sitting in a cubicle all day. Curiously enough, in the arts these days, where conceptualism still dominates, making by hand is not much respected and I think that this has led the arts away from something integral to the creative process. 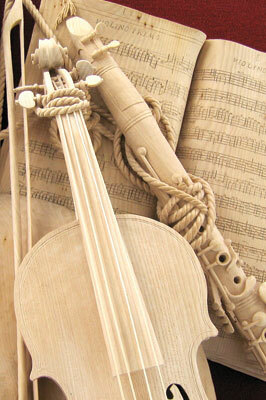 Really I wrote the book as much on behalf of woodcarvers as for them. 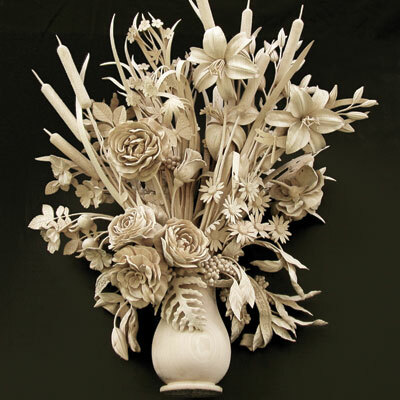 Woodcarving is emblematic of the kind of creativity that is grounded in manual work, and I think that this is interesting to the general public as well as to carvers. I hope that carvers in particular will enjoy the tale and feel a special kinship with it. It's a kind of detective story. Many of Gibbons' techniques were thought to be lost in the mists of history, so they had to be rediscovered if I was going to be able to re-make the Hampton Court carving successfully, and it wasn't at all clear that this would be possible. I made mistakes along the way, and had to learn from them, in the way that carvers do, or that we all do. I had a long commute back and forth from North London to Hampton Court - before iPods and iPads - and I filled the time by keeping an excruciatingly detailed journal of what had happened every day. So, 20 years later I was able to reconstruct the twists and turns of the story on an almost hour-by-hour basis, and tell the story with something of its original immediacy. WC: How, technically, do you reimagine the work of Gibbons? DE: For one thing, I've discarded the Gibbons motifs that don't have much meaning to me in the here and now. Unless I'm replacing something in an old piece I don't carve cherubs or lace cravats or cartouches. 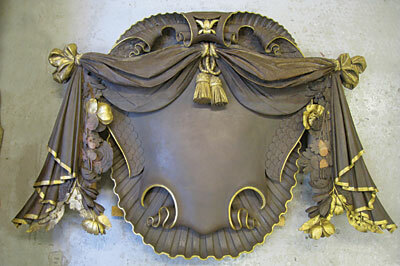 I don't even carve that ancient decorative motif that abounds in Gibbons' work: the acanthus leaf. I do things that Gibbons never did, like put insect damage and other tears and breaks, in my foliage and flowers. 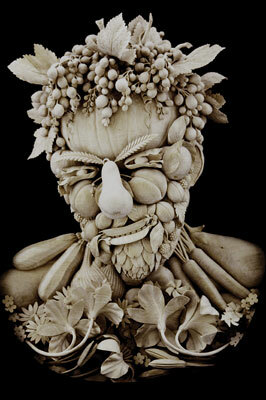 I'm also happy to incorporate objects from the present day if I'm doing a still life carving. There's an iPod and a digital camera, for example, in the piece I'm working on now. WC: What are you working on at the moment? DE: A 'letter rack'. I'd been looking for someone to commission me to do one of these for a long time, and last year found a wonderful, adventurous patron who knows this kind of painting well and saw at once how interesting the project might be. As I only work on commission, part of my job includes trying to get people to commission me to do what I want to do; it's the way the arts used to work. Learning how to handle this new form has proved to be just as stimulating as I'd hoped, though the carving has gone on much longer than I thought it would - as usual. I hope there will be other letter rack pieces to come; the form is rich with potential. You used to see them in hotels and clubs: boards with straps across them where letters and notices and found objects and suchlike are tucked. Dutch artists in the 17th century made still life paintings of these, including all sorts of objects. But I don't think anyone's tried carving one. I'm updating the form by including things like an iPod and iPhone. In January of next year I will have an exhibition in a gallery in NYC; in February the show will be expanded and go to the Munson Williams Proctor Art Institute - a distinguished museum in Utica in upstate New York near where I live. I also have an idea for another botanical head, this one transforming a certain famous portrait bust. And some other ideas as well, but you don't expect me to reveal everything do you? WC: Aside from your own projects, have you restored any Gibbons pieces recently? DE: Every once in a while I do a replacement carving for an old Gibbons era piece. Last year I provided the replacement carving for a mutilated 18th century carving at Winchester Cathedral. It used to be part of the high altar, but was moved to the South Transept in the 19th century, and severely damaged in the process. It was great fun to do, a detective story not unlike Hampton Court, with much research and hard analysis going into figuring out the form of the missing cartouche in particular. 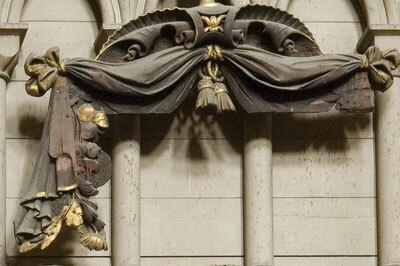 Considering that even in the time of Grinling Gibbons, woodcarving was a dying artform, it is incredibly rare for carvers to reach the level of recognition David has, both in terms of his carving ability and the level of academic expertise he has bequeathed future students of Gibbons. The dexterity and innovation of his carvings are such that it would seem more feasible if he was a self-taught brain surgeon. I'm sure there are many among us who wish that we, like David, could turn the sensation of being overwhelmed by the beauty of an object into the ability to create our own version of it. Since its first issue, Woodcarving has dedicated countless pages to the 'arts versus crafts' debate, but when confronted with breathtaking work like David's, you start to wonder whether it matters. Is there really a need to define between the two, reducing subjectivity to a question of semantics? Whether David's work is art or craft, it is sublime. It possesses the ability to fill its beholder with awe at the technical dexterity on show, the centuries-old techniques reinvented and the ability to manipulate solid wood into molten filigree. I know that I would rather have the chance to stare at his lime woodcarvings and marvel at their depth and intricacy than look at a portrait in a gallery. I'd like to end with a very heartening quote from David: "To portray organic subjects in an organic medium is to say something that can't be said any other way, and say it to the present age. In a time of radical destruction of the natural world, there's a poignancy to the beauty of fine foliage carving and the manual skills required to produce it, a kind of reproach that sharpens our awareness of what we are losing. Back, then, to craftsmanship and beauty? No, forward to it." Grinling Gibbons was a master carver who pioneered a style of lime wood carving featuring festoons dripping with foliage, fruit and flowers that brought the materials he carved to life. Born in 1648, like many proponents of the British Baroque, he was Dutch, arriving in England at the age of 19. The beauty of his work thrust him into meteoric fame and his name became synonymous with his famous patrons: King Charles II, James II and King William III to name a few. The beauty of his work propelled woodcarving - in the most part, a dying craft, even in the 17th century - to a status reserved for that of fine art.